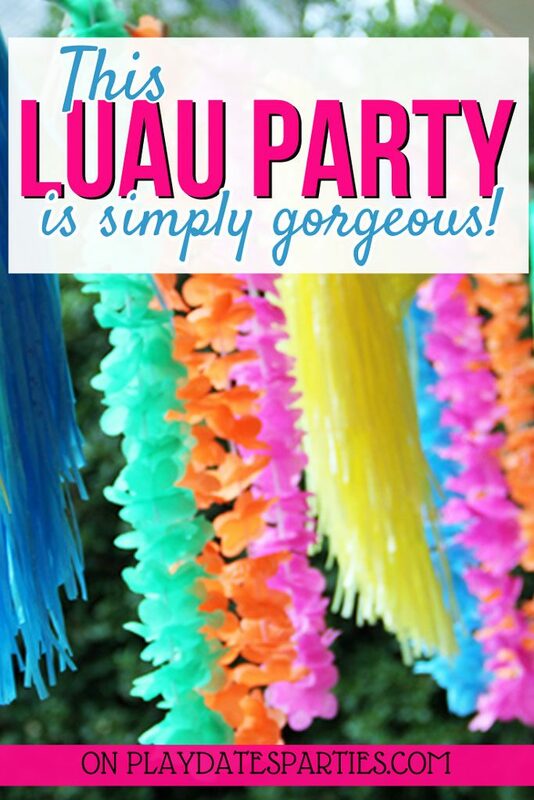 The luau is the quintessential summer party and this amazing backyard luau is full of decor you can easily recreate…even if you’re on a budget! What do you do when you’ve got the sweetest little girl turning seven years old and you’re too busy with work and your younger child to do much about it? You let someone else do the work, that’s what you do. In this case, that would be my former-caterer stepmother. She knows how to take easy-to-find items from Party City and The Dollar Store and turn them into one big ball of awesomeness. And this amazing backyard luau for my niece is the perfect example. To be fair, there are some over-the-top aspects of the party that are outside the average budget. Things like the giant slide, table and chair rentals, the miniature beach, and all the extra greenery add up very quickly. But don’t be fooled by the sheer abundance of decor. You can adapt many of the unique and creative ideas to host a party people will be talking about for ages to come. All big parties need to start with a grand entrance, right? In this case, the driveway was taken over with giant palms, a tiki archway, an “Aloha” sign and a colorful chalkboard welcome sign, all of which set the tone for this luau theme party. While bringing in giant palms and a full-size tiki archway may be out of most people’s budget, the chalkboard sign framed in Hawaiian leis is a simple touch just about anyone can pull together. Upon entering the backyard, guests were greeted with a 65-foot tiki-themed waterslide, multiple dining areas, and even a mini-beach (so glad I didn’t have to clean up after that). Our little one only went down the slide a couple of times in the arms of her uncle, but she’s still talking about it nearly two months later! Don’t have room for a giant slide or the budget for an inflatable pool? Add some inflatable palm trees to the top of a slip and slide for plenty of fun. One of the best tips I’ve learned from my stepmother is to go out of your way to make guests comfortable. For example, when hosting any kind of water-themed party, set aside an area for items guests may have forgotten. Extra towels, sunscreen, sun-visors, and sunglasses help to make your guests feel welcome. Inside the garage, guests were transported to a tiki bar. The ceiling was covered with decorative fishnets and seashell wind chimes, which are available at most party stores. Grass beach mats lined the walls, and every horizontal surface was covered with beachy decorations. One of my favorite details was the ribbon skirt on one of the tables. It just goes to show that luau party decor can go beyond just grass table skirts and tiki torches. Don’t be afraid to get creative with the menu, too. Even bell pepper and cucumber strips look festive with flowers as garnish. Another fantastic, low-cost lesson from this party: Make the most of your favors by using them as decor! Colorful grass skirts and Hawaiian leis were clothespinned to a string to create a colorful banner behind the mini beach. Bracelet leis were twisted around the stems of colorful Dollar Store tiki goblets. Have a collection of shells from beach visits? Now is the time to bring them out! Alternatively, you can buy luau colored glass beads in bulk and spread them everywhere. They’ll be useful for future parties, too! Simple touches like these are inexpensive and easy, but can really take your decor over-the-top. The kids even got to have a professional hula dancing lesson! T tried to join in but was barely able to do more than bounce along. It was adorable to watch her try. Why not try to learn a few hula moves before the party and conduct a lesson yourself? Our 2-year-old still talks about this party 2 months later! It’s easy to feel inadequate when you go to parties like this and your budget is barely one-tenth of what it must have cost. But by paying close attention to the details, you can often find that you can recreate a similar impression even with limited resources. and then incorporating them in creative ways, you can make your own amazing backyard luau too! What’s the Most Amazing Backyard Luau You’ve Been To? This is the coolest backyard party– that I actually think I might be able to copy — that I have ever seen!!!!!!!!!!!!!! I love the way you set up the seating, the food… and let's not even talk about the bouncy water thing. OMGosh — no way I can show these pictures to my 7-year-old. I just love what you have done! So much fun!!! Thanks Nadia! I didn't actually do any of the design work for the party, but really wanted to share this pictures with everyone. Seriously…these pictures don't even show everything (like the seating for the adults and the dinner buffet!) Hope to see you again soon! That looks awesome and I LOVE the giant slide! Whoever planned the party did an awesome job! The pictures look great, don't worry about the quality. I can totally feel the hawaiian spirit right now. Fantastic! @Ann-Kay – Thanks! I'll pass along the accolades. The giant slide was a huge hit! @Sara – Thanks for stopping by. I'll try to check out your link party soon! @craftedniche – Of course you're not to old for the slide! The adults were going down it as well…my BIL actually took T down it a couple times and she still talks about it! I didn’t actually put the party together, but it looks like she used tiki planters or vases and then put orchids inside them. I know that the hostess often finds a lot of her party decorations at TJ Maxx and Big Lots. Those stores may have something you want in stock right now since Luau parties are big during the summer. It also looks like you can get similar items on Amazon, just search under Patio, Lawn and Garden for “Tiki Head Pot” or “Tiki Head Planter” and then look for the size you want. Ok, this is absolutely, positively, amazing!! I want to go to that party! This sounds like a fun idea! It’s so colorful, too! Thanks so much for sharing with us at Merry Monday. Wow…I want a party like that for MY birthday LOL! You sure know how to throw a party…it looks fabulous! Thanks for sharing it with us at Share The Wealth Sunday! Over the top and gorgeous, the party stylist in me is head over heels in love with this! You sure know how to party!! It looks like so much fun and the decorations and food look amazing! Really cool….would love to do it for my grands! Wow, amazing luau indeed! My daughter wants a hawaiian-themed 9th birthday but I may have to scale it down from this amazing party. The jumping castle is a kids dream! Visiting from Celebrate Your Story party. Wow! What a awesome birthday party! Any kid would be excited to have an amazing party like that! Great job and everything looks so beautiful!! This party looks amazing! I love the homemade beach and the food looks delicious. What a great theme for a summer birthday. I remember my mom throwing a similar party. She swore by Oriental Trading. How adorable is this! Looks like every kid’s dream! ok what! how awesome is this and love all the decorations! Wow, this looks like an amazing party! I threw a Hawaii theme party for my toddler last summer and she had such a blast. Fun theme! Oriental Trader and the Dollar Tree are my go to’s for party supplies. This is a party that I would love to attend! Outstanding decor and food. That’s so smart to leave out extra sunglasses and sunscreen for your guests. I’ve never thought to do that before! Wow! That looks like an amazing and fun party! Pinned. OMG this is adorable!! I know it is a kid’s party but I would love to have this done even for my own birthday! 😛 so creative. Definitely saving this blog for later. What a fun party theme! This came out so nice!! Now that’s one lucky young lady to have such a grand party! Almost makes me wish I was that age again! Fantastic… no wonder she’s still talking about it. Yes, I bet a lot of things could even get bought at the dollar store and make a birthday party like that or similar at least! Great idea. Thanks for sharing! It really is an amazing party. She went all out for sure!! Thanks for sharing with SYC. 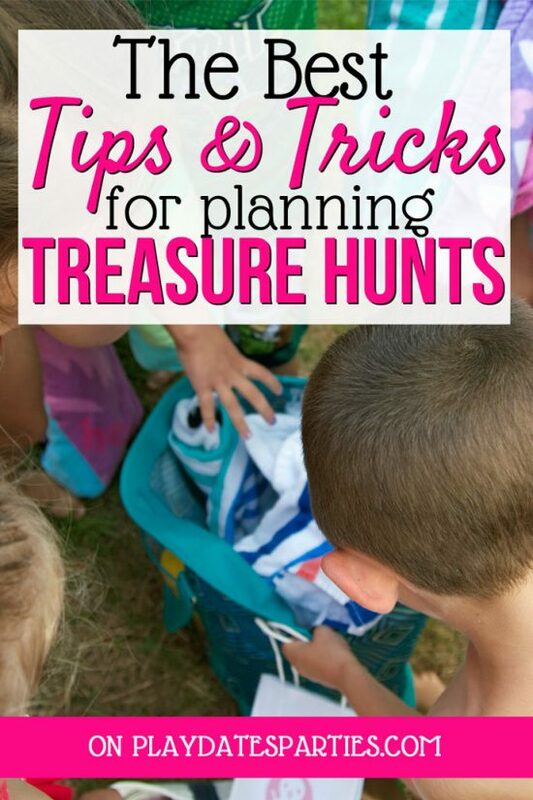 I love that this luau party is adaptable for both kids and grown ups! Your ideas really are fun! Scheduled to pin and share on the Hearth and Soul Facebook page. 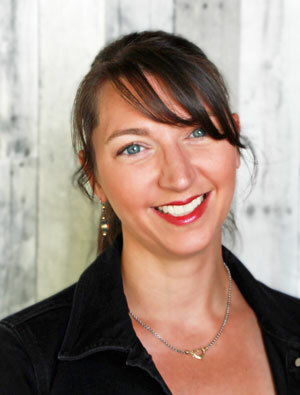 Thank you for sharing, Leslie, and for being a part of the Hearth and Soul Link Party. Have a wonderful weekend! This is pretty amazing! Thank you for sharing with us at Celebrate Your Story and have a great weekend. This is just darn cute! I love luaus and tropical parties! Thanks for sharing at Party in Your PJs! Wow! If the pics can convey fabulousness, I can only imagine what the real thing looked like. Your stepmother did a great job. I have seen most of the decor and accessories at Dollar Tree, but you are right about doing it big so it really pops. Thanks for sharing on Traffic Jam Weekend, Leslie.